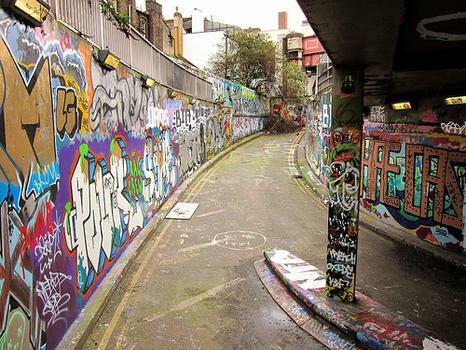 The Leake Street, also known as the 'Banksy tunnel', has a 300 m-street wall under the platform and tracks of Waterloo Station, completely covered in graffiti - initially created during the 'Cans Festival' organised by Banksy in 2008. The Leake Street, also known as the 'Banksy tunnel', has a 300 m-street wall under the platform and tracks of Waterloo Station, completely covered in graffiti - initially created during the 'Cans Festival' organised by Banksy in 2008. Whatever the strict legal position may be, there is a graffiti billboard outside the tunnel stating it is tolerated.